The other morning as I sat in my postage stamp of a back yard here in Joliet, watching house sparrows flutter and fuss in the blossom-laden branches of our flagrantly flowering lilac bush, I couldn't help but think of one of my favorite naturalists and Chicago writers: Leonard Dubkin (1905-1972). If you've never heard of him I would not be surprised. My own serendipitous discovery of Dubkin occurred on a visit to a used bookstore some ten years ago in Chicago's Rogers Park neighborhood, where I stumbled upon a well-preserved copy of his 1972 book, My Secret Places: One Man's Love Affair with Nature in the City. Reading just a few pages into this obscure and long out-of-print text, I knew immediately that I was in the presence of a kindred soul—and I was grateful for the sheer luck of finding that book, much as one might feel after spotting a morel on the forest floor or a forgotten five-dollar bill in a seldom-worn jacket. A self-taught naturalist and journalist who emigrated from Russia with his parents at the turn of the twentieth century and then lived in Chicago for almost all of his 67 years, Dubkin wrote hundreds of newspaper columns and several books of observational (and often humorous) stories about plants and animals he encountered here in the city. He was a careful observer and entertaining chronicler of urban nature long before literary critics identified the genre of urban nature writing, or restoration ecology became a recognized environmental practice, or Rachel Carson published Silent Spring. Like many of us who lead busy, multifaceted lives, Dubkin squeezed in his nature rambles here and there, in between work and errands and family duties; though he seemed determined, at least as he characterizes himself in his writings, not to get so caught up in the rat race of life that he didn't have plenty of time for slow-paced explorations of the world at hand. Dubkin went in search of nature by taking the bus to an empty lot at the end of the line, or more often by just walking about—though I doubt the mileage he covered on a typical exploration would chip away much at the 1000-mile annual goal described so eloquently by Liam Heneghan here on the City Creatures blog. My mind often leaps to Dubkin as my seven-year-old daughter and I take our daily stroll from the back door of our house to her school bus stop, a mere block away. On these mornings we usually only spend ten minutes outside while waiting for the yellow bulk of the bus to mosey up our street, though we make good use of the time, scanning the sky for appealing cloud formations, peering at the ground for wayward worms or industrious ants, and listening to the chorus of birdsong. "There's the white-throated sparrow again, Dad," Esmé will note matter-of-factly, quickly identifying the Old Sam Peabody-Peabody-Peabody melody line of this favorite passerine of mine. Such declarations make our short morning commute most gratifying. It's good to have a young sidekick out on the prowl for urban wildlife, and Esmé offers abundant and entertaining commentary on everything happening around her, from the tree canopy to the sidewalk cracks to the stone wall that always harbors a friendly orb-weaving spider or two. She slows me down, asks me questions, makes me think—and in the process, I end up seeing a lot of things I'd never notice otherwise. Dubkin, too, had a favorite companion on his nature rambles: his daughter Pauline, who spent many years taking walks with her dad throughout her childhood. Unlike the pace of many so-called overscheduled families of today, Pauline and her father happily spent many hours together in 1950s Chicago strolling through Lincoln Park, or exploring neighborhood streets, yards, or vacant lots on Chicago's North Side, where the Dubkins resided for many years in various apartments. Throughout the three years' worth of anecdotes and encounters collected in The Natural History of a Yard, Dubkin privileges the practices of close observation, patience, and slow exploration. He is neither an educated scientist or a competitive sort of naturalist (who strives to add to his or her "life list" above all else, a practice Dubkin never quite fathomed), but a storyteller about nature who simply yet cleverly reveals insights about plant-animal interactions; the behavioral ecology of insects, birds, and mammals; anthropomorphism and the scientific attitude toward nature; and the varied and conflicted relationships of humans toward the neglected, ignored, and sometimes vilified manifestations of urban nature. The Natural History of a Yard, as well as Dubkin's work as a whole, celebrates the variety and resilience of nature in the challenging city environment as well as our latent capacity to recognize and appreciate the "common" examples of wildlife—house sparrows, pigeons, robins, carpenter arts, aphids, moths, spiders, cicadas, and squirrels—amidst Chicago's concrete and hurrying human masses. Notable here is the argument that commonplace nature—the familiar (and, implicitly, unloved species)—holds as much interest and value as the charismatic species endemic to foreign locales. 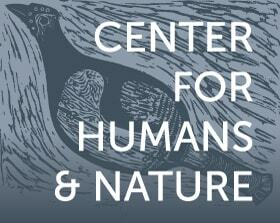 This interest has both intellectual appeal ("truth") for those who seek to learn about, say, animal behavior, ecological adaptations, predator-prey relationships, or other "mysteries of nature"; and aesthetic appeal ("beauty") for those in search of repose and reflection in communion with the natural world. Dubkin accomplishes this by dint of exceptionally patient or serendipitous observations, and sometimes through simple yet cleverly-contrived experimentation. The discovery of the owl has the feel of an illicit secret, for although Dubkin is aware that screech owls are not rare in urban areas, he did "not believe there was anyone in our building who even suspected that there were owls in our yard" (p. 23). Pauline, however, innocently reveals their presence to a key character of the narrative, Emil, the custodian and groundskeeper for the building. Emil tolerates Dubkin and Pauline's presence in the yard; but he fails to understand and appreciate their keen interest in the yard's natural history, and he immediately perceives the owl as a potential nuisance and threat. Dubkin employs Emil as a relatively benign stand-in for the dominant view of nature in the city as something that is ignored, at best; or suppressed or exterminated, at worst. In an age when trucks roamed the urban and suburban landscape spraying DDT along tree-lined streets for mosquito control and the chemical industry churned out an ever-expanding selection of poisons to eliminate pests inside and outside the home, Dubkin's fascination with and appreciation for all kinds of animal life, from the "flying rats" (as pigeons are still referred to by some urban citizens) to non-native birds to all kinds of creepy crawlies, definitely cut against the grain. Dubkin’s embrace of the familiar and commonplace is echoed in more recent years by the naturalist-writer Robert Michael Pyle, who argues in his 1986 essay "The Extinction of Experience" that our lack of familiarity with home landscapes and their native biota can arrest the development of one’s appreciation for nature. While Pyle emphasizes the critical problem of local extinctions—specifically, the elimination of locally native species—he also recognizes more generally the value of urban open space for allowing people to come into contact with all kinds of organisms, even the ostensibly “weedy species” of non-native colonizers. During his Aurora, Colorado, childhood, "unofficial countryside—vacant lots aplenty, a neglected so-called park where weeds had their way, yesterday’s farms, and the endless open ground of the High Line Canal looping off east and west" provided the foundation of his education in natural history (pp. 264-5). For Pyle, as for Dubkin writing four decades earlier, commonplace nature close at hand in the urban landscape is a place where familiarity can be cultivated and nurtured—even in less than pristine or ecologically degraded landscapes. Familiarity. Family. The common root of these words suggests that valuing the familiar creatures around us for the delight they bring and the lessons they teach are akin to nurturing the relationships within our human families—particularly when it comes to introducing children to the natural world, and in turn learning from their ability to listen, to see, to perceive. Through family we can expand our notion of the familiar; through apprehension of the familiar, we enlarge the scope of our families. Much as I recommend the practice of a neighborhood walk, whether to clear your head, loosen the limbs, or give yourself the chance to see something of our teeming animal world (familiar or rare) in the urban landscape, I also encourage you to dig around and find a copy of one of Dubkin's books . . . then lose yourself in it for a time. Like a furtive red fox in the suburbs, they're hard to find—but they're out there, if you're patient and keep looking. Let me know what you discover. Leonard Dubkin, 1905-1972; dust jacket photo from Dubkin's book, My Secret Places. Natural History of a Yard; photo from the Rare Book Cellar. Eastern Screech-Owl; photo by Mike Allen, Cornell Lab of Ornithology. Community garden at Dubkin Park, a small parkland on the far North Side of Chicago; photo from Dubkin Park Community Garden. Bryson, Michael A. "Empty Lots and Secret Places: Leonard Dubkin's Exploration of Urban Nature in Chicago." ISLE 18.1 (Winter 2011): 1-20. ________. 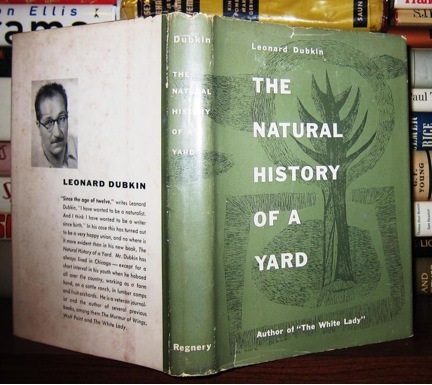 "Leonard Dubkin, Chicago's Urban Nature Writer: A Short Biography" (August 2008). Dubkin, Leonard. My Secret Places: One Man's Love Affair with Nature in the City. New York: David McKay, 1972. ________. The Natural History of a Yard. Chicago: Henry Regnery, 1955. Pyle, Robert Michael. "The Extinction of Experience," in Terrell Dixon (ed. ), reprinted in City Wilds: Essays and Stories about Urban Nature, pp. 257-67. Athens: Univ. of Georgia Press, 2002. Michael Bryson is a professor of humanities and the director of sustainability studies at Roosevelt University in Chicago (website: http://blogs.roosevelt.edu/mbryson/).